SALE! Discount! Special Offer! These phrases catch the eye of car shoppers! Want to personalize and create coupons to grab the attention of potential customers? You can! Just use our new Make-A-Coupon™ feature to create coupons for your website offerings! Easy to use, fast, and cost effective. Print your coupons. Even a simple text-only coupon works well. Create your own coupons with Autoxloo’s patented technology Make-A-Coupon™. Take advantage of quick custom coupon, where you get complete control over your coupon contents. Coupons used wisely can be a great promotional tool, they are a great way to attract new customers and retain existing ones. Make-A-Coupon™ lets you create coupons from already created templates. 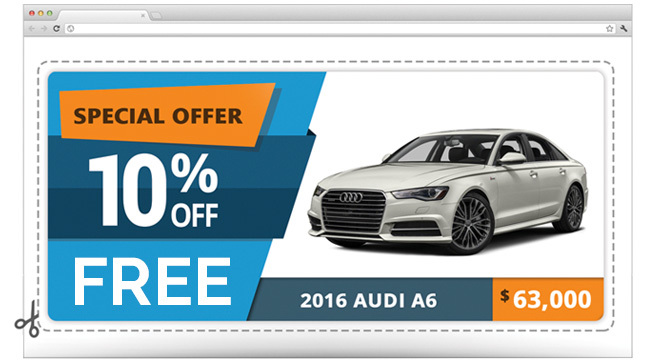 You won’t need any additional design experience to create professional quality coupons, easy a drag and drop elements to create online ads, coupons, and promotions. You can always return to your managing coupons page and click on any coupon to change them. Autoxloo has simplified the creation process. You can customize coupons exactly how you see them. Once your coupon is completely created, you can link, embed or print it as many times as you want. With more people spending time scanning the Internet, printable coupons have started to pop up on increasing numbers of websites. Instead of shuffling through hundreds of coupons which are printed in the newspapers, consumers now have the luxury of viewing coupons online. Every time a customer redeems a coupon, it’s an opportunity to connect with them on a personal level. Make-A-Coupon™ is a simple and cost-effective way to increase customer loyalty, build sales, and come out ahead of competitors. Together, we can meet the challenge and do so successfully.